Minutes of the Annual General Meeting of the Burton Green Residents’ Association held on October 5th 2015 at the Village Hall. The event marked a celebration of 60 years of Burton Green Residents' Association (BGRA). Old minute books were available for interest and everyone was offered wine and cake. The former had been donated by Liz Saxon in memory of her parents who had served on the BGRA in the 1950s; and thanks were given to Vicki Aizlewood for making the lovely cakes. Rona welcomed everyone, in particular Cllr. John Whitehouse; Sue Patterson, head of Burton Green School; PCSO Craig Ricardo; past chairs of the BGRA Gary Crooks and David Skinner. Cllrs. George Illingworth and Michael Coker joined the meeting at 8:30 after their attendance at a council meeting.She explained her aim was to make presentations as brief as possible allowing time for discussion of issues of importance. Apologies had been received from Liz Saxon; Cllr. Caryll Green; Paul Knight (clerk to the Parish Council); Cllr. Wendy and Geoff Exton; Peter and Janet Stanworth; Ann Blacklock; Mr and Mrs Silk; and Nicki Jackson. The minutes of the last Annual General Meeting of October 6th 2014 were accepted. Last month marked the 60th anniversary of the Residents' Association, which was set up in September 1955 with a membership of 100 paying subscriptions of five shillings! The Association has a proud history which we do our best to live up to. Petitioning against HS2 has again been a major issue over the past year. Together with the Village Hall Committee, the School, Parish Council and Greenway Trustees, we appeared before the Select Committee on January 6th to present our petition and were complimented on our coordinated approach. Our main “ask”, for a deep bored tunnel , was rejected on grounds of cost , with the important criteria of community sustainability given no weighting. Together with the Parish Council, we submitted a petition against AP2 (Additional Provisions 2) in August, focusing on extension of the cut and cover tunnel. This petition was not deemed to have locus standi and the Parish Council has approved use of Parish Funds to employ a barrister to challenge this judgement. The Parish Council and Residents’ Association’s opposition to a solar farm in Burton Green was outlined in last October’s report and we were delighted that Solihull Metropolitan Authority’s Planning Committee decided to reject the proposal. There is currently a high level of interest in a planning application by Hickory Smokehouse to develop a pub and restaurant at the Peeping Tom. To provide an opportunity for residents to find out more, we have arranged a meeting at the Village Hall on Friday October 23rd. (See also report from Cllr Wendy Exton). Parking on pavements in the village has been a controversial issue and we have worked with the Parish Council to draw up some helpful suggestions for residents. The Residents’ Association has continued to be proactive in reporting potholes, fly tipping, overgrown hedges in Red Lane and obstructions to rights of way. We are pleased that WDC is planning some reconstruction of the bank beside a particularly narrow section of Red Lane, following our frequent expressions of concern. We have continued to work on the Residents’ Association Parish Plan tasks and have now completed them all, including the installation of flower tubs ! The Speedwatch Teaam has been operating often twice a week throughout the year and their work is having a real impact on the safety of our roads. The Jubilee Group organised an extremely successful Circus Event in June and plans for June 11th 2016 are well underway. The Retired of Burton Green lunches continue to be well attended with a well- deserved reputation for fabulous food and good company. It has been a very successful year for fundraising, with a coffee morning and lunch raising £374 for the Macmillan Cancer Charity and an amazing £2800 raised for Nepal in an afternoon tea and curry evening. The four editions of the Bugle, funded partly from residents' £3 subscriptions and also from a Parish Council donation, have played a vital role in keeping residents up to date during the year. The editor welcomes contributions. We see it as important to consult Burton Green children and young people about what they want for their community and have established an annual Youth Forum , which takes place this year during a quiz evening on Friday, October 9th, 6.30 -8.30pm at the village hall.Sincere thanks are due to all for the high level of commitment to working for the community and for the amazing support for Burton Green initiatives and events. Rona asked Alan Dearnley-Davidson to update residents on the availability of superfast broadband. This was now available to all residents connected to cabinet 20 at the top of Red Lane. Those connected to the Tile Hill cabinet would have to wait until 2016. Advantages of switching to superfast broadband included boosting the sale of a house and the ability to stream TV. Opting to receive the CSW Broadband newsletter would provide residents with fuller information but Alan was happy to talk to anyone on the subject outside the meeting. The Income & Expenditure Account and Balance Sheet are attached separately. Copies were available at the meeting. Expenditure had included work opposing HS2 and the solar farm. He said BGRA had three forms of income: the annual residents’ subscriptions of £3 per household; grants for specific items which were ring fenced; and a small profit from events such as the Retired of Burton Green lunches. He pointed out that the collection of subscriptions often crossed two financial years. Terry thanked Peter for inspecting the accounts. In turn, thanks were expressed to Terry. The constitution required that the officers and three committee members should stand down. All the officers (Rona Taylor, Mary Webb, Terry Heyes, Janet Hickinbottom and Judi Hibberd) were re-elected. Faith Ward and Hilary Cox stood down and were re-elected as committee members. Andy Gibbs explained that BGRA along with other organisations and individuals had petitioned in parliament in January 2015. This had been quite an experience for all and although not all matters had been successfully addressed such as the request for a bored tunnel, there were some amendments made as a result of the petitioning. For example, the traffic route for construction traffic was moved away from Hob Lane and the school; various work camp sites were moved; an equine underpass was agreed and the cut and cover tunnel was to be lengthened. AP2 had more recently been petitioned against by some but with less success. Individuals and Jeremy Wright MP could still appear before parliamentary representatives to present residents’ concerns. In the future the bill would also have to pass through the House of Lords so the fight continued. Proper compensation would be something to work towards. Fight continues. Maybe in the future proper compensation may be something to work towards. Cllr. Archie Taylor said the Parish Council had agreed to appoint a barrister to take things forward and he acknowledged the expertise of solicitor Ian Cox. He said so many people remained opposed to HS2 as he had witnessed at the Labour party conference. Thanks were given to Andy. David Skinner asked what the disposal route would be for waste. Andy replied that most would continue on down the line until it reached the Kenilworth A429 or Balsall Common via Waste Lane. Was Crackley Lane to be widened? This had been considered in an earlier draft but was not accepted. Would there be increased traffic on Bockendon Road? A little but this was mainly concerned with pipeline changes. Bockendon Road would offer an emergency escape route at end of the rail building process. Diane Swindells explained that the site of the new village hall was to be in the field next to the Broadwell Wood park homes site at the top of Red Lane. Much work had gone into research and planning and ongoing discussions were being held with HS2 Ltd. It was planned to have a new hall with increased capacity and higher specifications. A new Village Hall constitution was being drawn up as it was felt the old one was not fit for purpose. Petitioning in January had been successful in certain respects for the Village Hall and the AP2 petitioning had focused on the lack of mains sewerage on the site in Red Lane. Finally, a craft fair was to be held on Sunday November 22nd and a Christmas lunch was being organised for the retired on Friday December 4th. Residents would be welcome to the Village Hall AGM at 7pm on November 27th. Sue Patterson, the head teacher of Burton Green School, presented a report giving a flavour of the school’s activities during the year. Many people new to the area were still unaware of the school’s existence and so residents were urged to make this known. Currently, the school had 105 pupils and 12 members of staff. She explained the school was small but with a special environment and offered a large range of quality experiences to the children. It had good SATs results and was making good progress. All the children were known individually to all staff and there were great benefits to belonging to the Green Leek Federation with All Saints of Leek Wootton. This meant the pupils had access to more sporting, music and drama activities and all children in years 5 and 6 had taken part in a residential visit to Norfolk during the year. There were also widening opportunities for staff across the two schools who shared training. Sue reminded everyone of the community picnic held at the school in the summer to celebrate the opening of the new land and facilities at the side of the school. During the summer holidays the front playground had been transformed to address health and safety issues. At the rear, the playground had been extended and a netball court incorporated. Modern facilities were housed at the back of historic buildings. Sue wanted the community to be proud of its school. Thanks were given to everyone who had volunteered over the years. Currently, residents could continue to help by attending school events or by volunteering to hear children read. The school was trying to enable children to be active participants in the community.All the children were known individually to all staff and there were great benefits to belonging to the Green Leek Federation with All Saints of Leek Wootton. This meant the pupils had access to more sporting, music and drama activities and all children in years 5 and 6 had taken part in a residential visit to Norfolk during the year. There were also widening opportunities for staff across the two schools who shared training.Sue reminded everyone of the community picnic held at the school in the summer to celebrate the opening of the new land and facilities at the side of the school. During the summer holidays the front playground had been transformed to address health and safety issues. At the rear, the playground had been extended and a netball court incorporated. Modern facilities were housed at the back of historic buildings. Sue wanted the community to be proud of its school. Thanks were given to everyone who had volunteered over the years.Currently, residents could continue to help by attending school events or by volunteering to hear children read. The school was trying to enable children to be active participants in the community. Derek Lawrence, as chair of the Friends of Burton Green School, said residents wouldbe welcome to join in the variety of events planned. Last year the group had raised £4600 mainly through the summer and Christmas fayres and funds had helped to purchase musical instruments and to support school visits. Derek explained he was developing an electronic calendar to contain details of the events organised within the village by a variety of groups. Deirdre Vernon explained that Made in Burton Green was a village event incorporating an arts and crafts exhibition at the Village Hall and scarecrow competition (open to all), set against the backdrop of the Kenilworth Greenway that runs through the village. The plans for 2016 were for a “larger than life” project a showcase of local arts and crafts talent and refreshments at the village hall. There will be a chance to vote for your favourite scarecrow. The exhibition is part of the Warwickshire Open Studios initiative and will be open on 25 &amp; 26 June 2016. 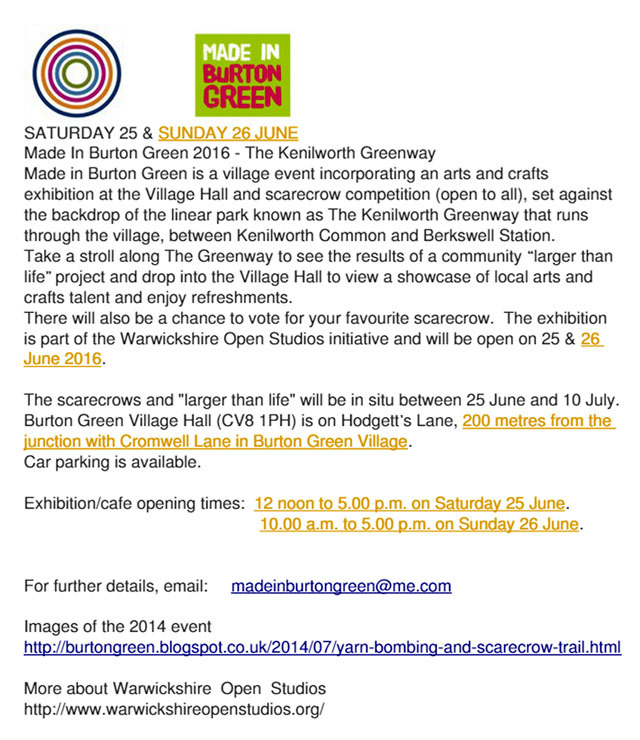 The scarecrows and &quot;larger than life&quot; will be in situ between 25 June and 10 July. Pat Hehir said the village Speedwatch had now been operating for two and a half years. The volunteer team tried to operate once a week. Since April 1st when the speed limit changed on Cromwell Lane, 590 cars had been recorded exceeding the limit. 420 of these had received warning letters. He felt Speedwatch was having an impact. Thanks were given to the team of six plus Craig and his team who had been supportive. Any new volunteers would be welcome.A question was asked about how it was decided where speed checks were in operation and whether Speedwatch could operate in Hodgetts Lane. Another resident queried the location of the operation in Red Lane. It was explained that decisions on priorities were taken at the Kenilworth Community Forum every three months and all were urged to attend. Questions were asked relating to follow up by the police. Craig said repeat offenders received a more strongly worded letter and the local Safer Neighbourhoods team might be involved. It was not possible to link up with the Coventry police force on such matters apart from passing on relevant information. PCSO Craig Ricardo said the most serious reported crime in Burton Green had been the theft of two hanging baskets and theft from a motor vehicle. Obviously, it was good to report such a low level of crime but residents needed to stay alert and report potential burglars and other concerns via the 101 phone number. For example, door to door travelling salesmen should be reported as they were not operating legally. He advised residents to be security conscious by leaving music playing when the house was unoccupied and not to leave any valuables including satnavs on show in vehicles. A question was raised about cycling on footpaths. Craig said it was illegal for over 16s to do this and they could receive a warning. If this was a persistent problem residents could report it but a witness was always needed. County Cllr John Whitehouse said councillors were not allowed to petition but he had been able to as a member of the Greenway Trust. He was pleased that the points about improving sound attenuation and changes to the temporary route through the greenway looked likely to be tackled. There had been delays in the implementation of the new speed limit changes but this did happen and was at the third attempt. Evidence of impact was still patchy and monitoring continued. Two 40mph flashing signs had been moved to Red Lane increasing the number to four. He was aware of a desire amongst residents to see a change to 30mph for all of Red Lane but there was still not enough money to do that. Meanwhile, it was necessary to persuade the traffic to observe the 30mph limit. There was a set of proposals for Red Lane in place to improve signage eg size of repeater roundels, road markings and speed warning signs near bends with advisory 30mph signs. Cllr Whitehouse reported that the station in Kenilworth was still on track for Dec 2016 if Network Rail had completed their part. County council boundaries were set to change and from April 2017 Burton Green would form part of Lapworth and West Kenilworth division. The county was part way through saving £92million over 4 years. This had necessitated the removal of many non statutory services such as housing support for vulnerable people and home to school transport. The county was facing decisions about school sufficiency: how to make sure there were enough school places to cope with housing developments. Would there be a significant shortfall of capital to build schools to fulfill this? Should Warwickshire go in with the West Midlands authorities in a combined authority? Warwickshire had declined the offer presented. It was generally felt that Coventry was the right partner or there might be other solutions. Cllr Whitehouse was keen to make everything transparent and available to the public.He stressed again the importance of the community forum and said the local community was welcome to apply for community funds. A query was raised about reversing the traffic priority on the Cromwell Lane bridge. There were diverse opinions on this. Cllr Whitehouse said only if there was clear evidence of danger would this be looked at. District Cllr Michael Coker, now mayor of Kenilworth, said the District was likely to agree with the County and go for Coventry as the partner authority. At present far greater clarification was needed of what was on offer. The Local Plan had been suspended, claiming it relied on windfall sites. The inspector had said there must be agreement on five more potential housing sites on Warwickshire, to be allocated in all districts.District Cllr George Illingworth pointed out minor changes in Stoneleigh under AP4. He reminded residents that boundaries had been redrawn about a year ago placing Crackley Woods in Kenilworth and the university in Burton Green. With regard to planning applications, a site in Red Lane was a permitted development. The fight against Broadwells Wood site had focused on the importance of a level site. It was hoped hedging would be replanted. The Peeping Tom had applied for modest extensions. As a public house it could also operate as a restaurant. Environmental health had suggested a note to be added to any agreements. Problems could be dealt with retrospectively if a nuisance occurred. He said the Parish Council was concerned about the potential increased number of houses. The Burrow Hill site was in the Local Plan but it might be that more houses were needed. Could residents living at Broadwells Wood be included in these numbers? He welcomed new residents there. Cllr Taylor recommended everyone with internet access to subscribe to “Paddy’s loop” which circulated information of interest to villagers via email. He looked forward to the enhancement of the Peeping Tom and said the parish council would make sure residents' concerns were addressed. He felt the Hickory Smokehouse management would be supportive of the community. On the forthcoming Remembrance Sunday Cllr John Vine would be laying a wreath on behalf of Burton Green. There were many challenges lying ahead for the parish council but he felt sure they would work hard on behalf of residents and thanked everyone for their support. Thanks were extended to all who had initiated or supported events. Thank you was expressed to Janet for writing the minutes. Faith Ward said thanks must go to Rona too. The next Annual General Meeting would be held on Monday October 3rd 2016 at the Village Hall.